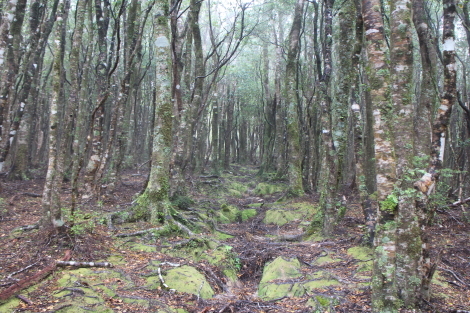 The Tararua State Forest lies about one and a half to two hours north of Wellington on the North Island of New Zealand. The forest is characterised by a series of parallel ranges divided by deep river valleys, with numerous tracks to the peaks, across the ridges and through the forest. The Tararuas are popular with New Zealanders, receiving more than 100,000 visitors a year, albeit most are day trippers or picnickers. Multi-day hikers are well served with numerous huts and tracks which vary in difficulty – from well graded valley walks to routes along mountain ridges. The ranges are not high, the summits being between 1300m and 1500m above sea level, but this lack of height is deceptive. Weather in the Tararuas can be notoriously bad as the shelterless tops are regularly hit by storms and extreme winds. There have been many unfortunate tramping accidents in the Tararuas and the area is famous for the Such search and rescue – a search for a group of four overdue hikers in the 1930s which helped pave the way to the search and rescue system now in place in New Zealand. North Islanders claim that if you can hike in the Tararuas, you can hike anywhere. For experienced trampers there are classic hikes such as the Southern Crossing, a 3 day hike which traverses the Tararua tops from Otaki Forks on the western side across to Kaitoke on the south eastern side. For those interested in more accessible, less difficult hikes, the two most popular tracks on the eastern side of the State Forest are the Jumbo Holdsworth Circuit and the Holdsworth to Kaitoke tramp. We had planned to do the Holdsworth Jumbo Circuit, a hike up through the forest along the Gentle Annie track to above the bushline at Powell Hut, followed by a hike up to Mt Holdsworth and ridgeline traverse to Jumbo Hut, finishing with a descent to the valley floor and gentle amble along the Atiwhakatu Stream back to Holdsworth. The pictures we had seen and accounts we had heard from others suggested that the Holdsworth Jumbo Circuit rivals the Kepler Track, but without the Great Walk status and the crowds that go with that status. Unfortunately the weather was not with us and for safety reasons we ended up hiking a part of both circuits. Getting there. Holdsworth is the main entrance to the eastern side of Tararua Forest Park, where you can stay at either the Holdsworth lodge or camping site (both bookable through the Department of Conservation (DOC)). The closest town on the eastern side is Masterton which can be reached from Wellington by train ($18 pp one way). Holdsworth is 20km from Masterton and taxi companies will take you there and pick you up several days later for about $100 return. Otaki Forks is the main western entrance to the Tararua Forest Park, where you can stay in the camping area. Otaki Forks is 19km inland from Otaki township – about 1½ – 2 hours by bus from Wellington. Accommodation. There are three huts on the Jumbo – Holdsworth circuit: Powell (serviced, 28 bunks, $15 pp); Atiwhakatu (standard, 26 bunks, $5 pp); and Jumbo (serviced, 20 bunks, $15 pp). There are three huts on the Holdsworth to Kaitoke tramp: Totara Flats (serviced, 26 bunks, $15 pp); the historic Cone hut (basic, 6 bunks, free); Tutuwai (serviced, 20 bunks, $15 pp). Each of the serviced huts has mattresses, a wood stove for heating, water (rain collected from the roof) and contained drop toilets. In addition, at the time of our trip both the Powell and Jumbo huts had gas for cooking. Both the Powell and Jumbo huts are popular and must be booked in the period between 18 November and 30 April. This can be done online, however, if you have a backcountry pass we found there was no way to use it with the online booking system. The only way to deal with this is to do the booking over the phone with the Wellington or Masterton DOC offices. Day 1 Holdsworth to Powell Hut (7.5km, 3-4 hours). The track up to Powell Hut from Holdsworth may only be 7.5km, but, as you start at about 300m above sea level and finish just above the bush-line at about 1200m above sea level, it is nearly all up. We broke the hike down to three sections of an hour each, give or take 5-10 minutes. The first section was from Holdsworth to Rocky Point lookout, the point where most day trippers turn back. From Holdsworth we crossed a bridge over the Atiwhakatu stream and headed up the track in the direction of Donnelly Flat. We turned left at a signpost marking the way to Powell Hut and Rocky Point and followed the well graded Gentle Annie track. The track started flat but soon moved to a reasonable gradient – I counted 241 stairs. The Rocky Point lookout was a turn off of about 2 minutes from the main track and well worth a look. The second section between Rocky Point and Mountain House shelter was through open bush and fairly flat. After passing the junction with the Totara Flats track we reached some boardwalks which crossed an area known as “Pig Flats” before a short descent to the shelter where we stopped for lunch. The last section between Mountain House Shelter and Powell Hut was a much steeper gradient (537 stairs and that ignores all the tree roots which acted as stairs) and passed through a more dense forest. Just before reaching the bush line we passed a DOC ranger hiking in the opposite direction and heading to Jumbo Hut. When I asked why he was going the long way round he responded that there was no way he was crossing the tops in the wind. We were soon to discover what he meant – as we got above the bush-line the winds howled around us and it was a struggle to keep our feet. Fortunately Powell Hut was only a short walk from the bush-line and we were relieved to be able to close the door on the winds. Other than a DOC ranger who came up from Atiwhakatu Hut (the rangers in the park switch around their stays in the serviced huts) we had the hut to ourselves that evening. Day 2 Powell Hut to Totara Flats Hut (10km, 4-5 hours). We awoke to no abatement in the winds. A discussion with the DOC ranger confirmed what we were thinking – it wasn’t safe enough to cross the tops to Jumbo Hut (she explained that the winds would need to be 20km an hour less than the then existing 65 km an hour before she would be comfortable with us doing the crossing). Fortunately there are enough huts in the Tararuas that if Plan A is foiled you just move to Plan B or C. Further discussion with the DOC ranger led to a decision to drop down into the valley and hike to Totara Flats hut and the next day hike out to Holdsworth car park – she had dismissed our original Plan B of hiking down to Atiwhakatu Hut as too tame and suggested that we would find the Totara Flats track a lot wilder. So it was back the way we came, retracing our steps down to Mountain House shelter, crossing Pig Flats and turning off at the Totara Flats junction. Turning on to the Totara Flats junction we could immediately see what the ranger meant about the comparative wildness of the two tracks. 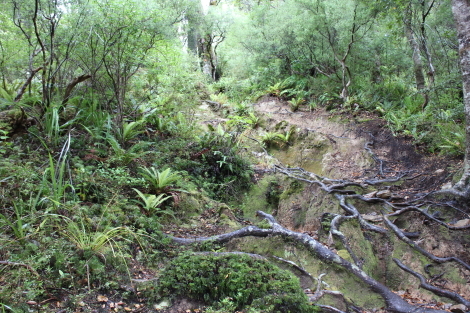 The Totara Flats track was a mix of gullies and tree roots which, in the drizzly humid conditions, were quite slippery. Our trip down the track was further slowed by the knee soreness created by our first hour hiking down the stairs from Powell Hut (my first serious knee soreness of the trip). A bit over two and a half hours and we finally reached Totara Creek (it should have taken about an hour and a half) crossing to the other side via a bridge. A further 50 minutes along a level track following the creek and we crossed the swing-bridge over the Waiohine River and a further 5 minutes and we were at the hut. Fortunately for us the winds in the valley were not too bad, as the ranger had warned us that the swing-bridge tended to be a tricky crossing in high winds. Day 3 Totara Flats hut to Holdsworth (11km, 4 hours). Acting on the assumption that we would be hiking the Holdsworth Jumbo circuit we had pre-arranged for the taxi to pick us up from Holdsworth. This meant that we couldn’t complete the Holdsworth Kaitoke tramp but had to hike out the way we had come in. We retraced our steps back along Totara Creek and then back up the steep Totara Flats track. Setting a steady pace I found the going up easier than the trip down the previous day. A bit under three hours of walking from when we had set out from the hut and we were back at the junction with the Gentle Annie track. We took advantage of the seats provided by DOC to have a bit of lunch and then started heading down to Holdsworth. After a bit we passed a fellow hiking up the track, looking red faced and as though he was struggling a bit. We said hello, but he seemed intent on pushing on so we carried on down the track. A little bit concerned for him, I still couldn’t help thinking that I was getting fitter as there were now hikers who seemed to have a harder time than me on the ascents. Ten minutes after we passed into him we bumped into a couple more hikers. This couple was far more chatty and asked if we had seen their friend. After we responded that he was only about 10 minutes up the track they asked how old we thought he was. Our guess was wildly wrong – it turned out that he was 81. So apparently I am fitter than an 81 year old – yay me. It wasn’t long before we were back at Holdsworth, waiting for our taxi. It was a shame we weren’t able to do the Holdsworth Jumbo circuit, but it’s just another reason we will have to return to New Zealand for some more hiking. For more information: see our A Beginner’s Guide to Hiking in New Zealand post. The Matemateaonga Track – All by ourselves in the Whanganui National Park. A Journey to The Centre of the Earth – Canyoning in Karijini.